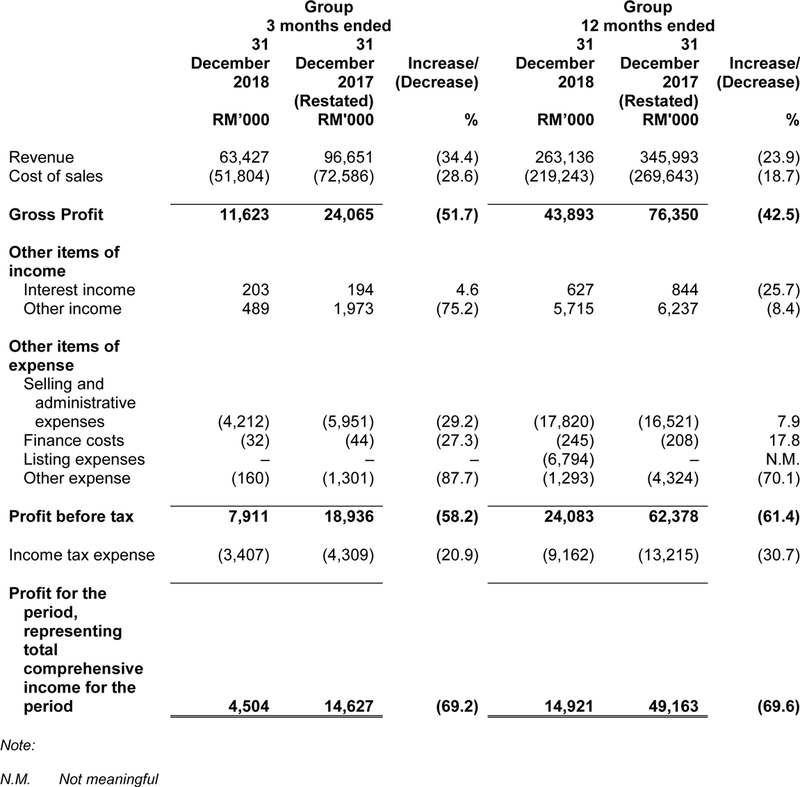 The Group's revenue decreased by approximately RM33.2 million, or 34.4%. This was mainly attributable to the decrease in the number of laden container ("40–ft containers") sold from 1,820 40–ft containers in 4Q2017 to 1,154 40–ft containers in 4Q2018 as a result of lower demand from customers mainly from the United States of America ("US") due to a drop in demand from the Group's customers. However, the decrease is slightly offset by the increase in the average selling price per container from RM53,000 in 4Q2017 to RM55,000 in 4Q2018 as a result of the strengthening of the USD against RM. Cost of sales decreased by approximately RM20.8 million, or 28.6% mainly due to the decrease in raw materials purchased, labour costs and subcontractors' costs. The decrease in these costs was mainly due to the lower level of production during 4Q2018. Gross profit decreased by approximately RM12.4 million, or 51.7%, and gross profit margin decreased from 24.9% in 4Q2017 to 18.3% in 4Q2018 as a result of the decrease in the number of 40ft containers being sold during the 4Q2018 (where the economies of scale is better achieved in 4Q2017 as compared to 4Q2018) despite an increase in the average selling price per container. Interest income increased by approximately RM0.01 million, or 4.6% mainly due to more cash being placed in short term deposits in the bank account maintained in Malaysia. Other income decreased by approximately RM1.5 million, or 75.2% as a result of the Company selling lesser boards to LP Global Resources Sdn Bhd ("LP Global") to manufacture front drawer for most of our models (including lamination services) in 4Q2018 as compared to 4Q2017 due to the drop in demand from the Group's customers. Selling and administrative expenses decreased by approximately RM1.7 million, or 29.2% mainly due to the decrease in staff costs, directors' remuneration and upkeep and maintenance cost. The decrease in depreciation of property, plant and equipment by approximately RM0.8 million was due to the lesser acquisition of machinery & equipment, office equipment and furniture and fittings in 4Q2018 as compared to 4Q2017. As a result of the foregoing, the Group's net profit for 4Q2018 decreased by approximately RM10.1 million, or 69.2% as compared to 4Q2017. the decrease in the average selling price per container from RM53,000 in FY2017 to RM50,000 in FY2018 was the result of the strengthening of the RM against US$. The average movement of RM against USD has strengthened by approximately 6.2% in FY2018 as compared to FY2017. Cost of sales decreased by approximately RM50.4 million, or 18.7% mainly due to the decrease in raw materials purchased, labour costs and subcontractors' costs. The decrease in these costs was mainly due to the lower level of production during FY2018. Gross profit decreased by approximately RM32.5 million, or 42.5%, and gross profit margin decreased from 22.1% in FY2017 to 16.7% in FY2018 as a result of the decrease in the average selling price arising from the strengthening of the RM against US$. As explained above, the average RM against the USD has strengthened by approximately 6.2% in FY2018 as compared to FY2017. The lower gross profit was also affected by the decrease in the sales to the Group's customers. Interest income decreased by approximately RM0.2 million, or 25.7% mainly due to lower interest rate for cash being placed under short term deposits in the bank account maintained in Singapore. 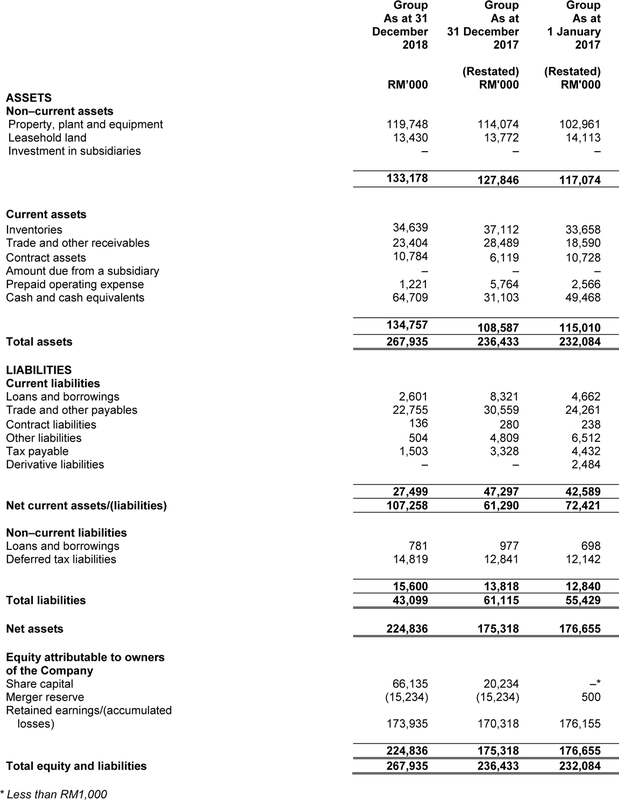 Other income decreased by approximately RM0.5 million, or 8.4% as a result of the Company selling lesser boards to LP Global to manufacture front drawer for most of our models (including lamination services) in FY2018 as compared to FY2017 due to the drop in demand from the Group's customers. Selling and administrative expenses increased by approximately RM1.3 million, or 7.9% mainly due to the increase in advertisement, exhibition & promotional expenses, utilities, gift, donation & condolences expenses and general office expenses such as printing & stationery and postage & courier charges. As a result of the foregoing, the Group's net profit for FY2018 decreased by approximately RM34.2 million, or 69.6% as compared to FY2017. Property, plant and equipment increased by approximately RM5.7 million, or 5.0% mainly due to the purchase of machinery and equipment, construction of hostel workers and expansion of office building in progress as well as a motor vehicle during the FY2018. Leasehold land decreased by approximately RM0.3 million, or 2.5% due to the amortisation of the leasehold land. Inventories decreased by approximately RM2.5 million, or 6.7% mainly due to the overall improvement in inventory management by the Group. Trade and other receivables of approximately RM23.4 million comprised trade receivables, receivables from related parties, deposits and other receivables. The decrease in trade and other receivables by approximately RM5.1 million, or 17.8% was mainly due to the decrease of sales towards the end of FY2018. Contract assets of approximately RM10.8 million comprised the right to consideration for goods produced but not yet billed as at 31 December 2018 for sale of goods. The increase in contract assets by approximately RM4.7 million, or 76.2% was mainly due to the completion of goods produced expected to be delivered in the first quarter of 2019. Prepaid operating expense of approximately RM1.2 million comprised mainly expenses paid in advance as at 31 December 2018. The decrease in the prepaid operating expense was due to IPO expenses either being expensed off to the income statement or capitalised to equity in FY2018. Loans and borrowings comprised obligations under finance leases, short–term trade financing and bankers' acceptance. The decrease in loans and borrowings by approximately RM5.9 million, or 63.6% was mainly due to the decrease in the usage of short term trade financing towards the end of FY2018. Trade and other payables of approximately RM22.8 million comprised trade payables, amount due to related parties, contract liabilities and sundry payables. The decrease in trade and other payables of RM7.8 million, or 25.5% was mainly due to the settlement of debt towards the end of FY2018. Contract liabilities of approximately RM0.1 million comprised the Group's obligation to transfer goods or services to customers for which the Group has received consideration from customers as at 31 December 2018. Other liabilities of approximately RM0.5 million comprised accrued operating expenses, advances from customers and accrual for purchase of equipment. The decrease in other liabilities of RM4.3 million, or 89.5% was mainly due to lesser accrued expenses as at 31 December 2018 as a result of lesser allowances and performance incentives being provided. Tax payable of approximately RM1.5 million comprised estimated tax liabilities that the Group is liable to pay for the FY2018. The decrease in tax payable of RM1.8 million, or 54.8% was mainly due to the decrease in the expected tax payable for the FY2018. The Group recorded net cash flows from operating activities of approximately RM22.9 million in FY2018 which was lower as compared to approximately RM46.1 million in FY2017 mainly due to the decrease in the sales of the Group during the FY2018. The Group recorded net cash flows used in investing activities of approximately RM10.6 million in FY2018 mainly due to the purchase of new machineries with improved capabilities. The Group recorded net cash flows generated from financing activities of approximately RM21.6 million in FY2018 mainly due to the proceeds from the issuance of new shares pursuant to IPO. Our exports to US have reduced in FY2018 as many US customers have exercised more caution in their purchases due to the uncertainties in the trade war between China and US. As the trade war is still on–going, there is still uncertainty as to how this trade war will impact our Group in the financial year ending 31 December 2019 ("FY2019"). We had on 20 December 2018, through our wholly–owned subsidiary, Leyo Holdings Sdn. Bhd. ("Leyo Holdings"), entered into an asset purchase agreement ("APA") with Cubo Sdn. Bhd. ("CSB"), a company incorporated in Malaysia, and Mr Ng Teck Lai ("NTL") (collectively referred to as "Vendors"), pursuant to which the Vendors have agreed to sell the assets comprising intellectual properties, plants & machineries, fixed assets and other assets (the "Assets") to Leyo Holdings in accordance with the terms and conditions as stipulated in the APA ("Acquisition"). The Acquisition was completed on 25 January 2019. Concurrently with the signing of the APA on 20 December 2018, we had also entered into a shareholders' agreement ("SHA") with Lebo Design Sdn. Bhd. ("Lebo Design") and Leyo Holdings to give effect to our and Lebo Design's intentions to co–operate with each other to carry on business of manufacture, sell, market and distribute furniture under the brand names EZBO and CUBO ("Business") and to regulate their relations inter se and in the conduct of the business and affairs of Leyo Holdings. Through the Acquisition, we are expanding into a new business involved in the original brand manufacturing ("OBM") of furniture products. As the brand names are new in the market, we intend to further promote them in various countries and thus far, the response from potential customers have been positive. Based on the product designs and innovations and with the right marketing strategies, we are cautiously optimistic that this Business will grow in the second half of FY2019.